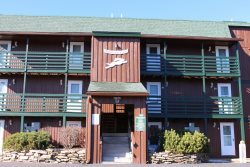 Book this cute and cozy one bedroom, one bath Powderidge condo for your stay at Snowshoe Mountain Resort. This condo has a fully equipped kitchen with microwave, dishwasher, and a full sized refrigerator. Curl up next to the fire to keep warm on those cold winter nights. Enjoy the convenience of being in a ski-in/ski-out complex and the shuttle stop is out the front door.